Vacation rental house. 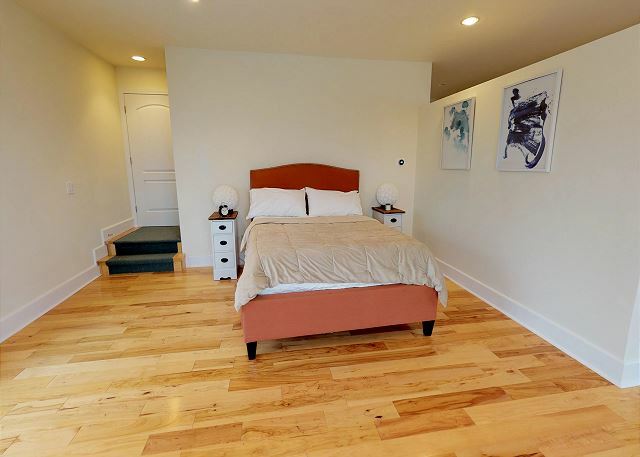 Sleeps 14, 3 bedrooms, 3 bathrooms. No pets allowed. Welcome to a rare find! 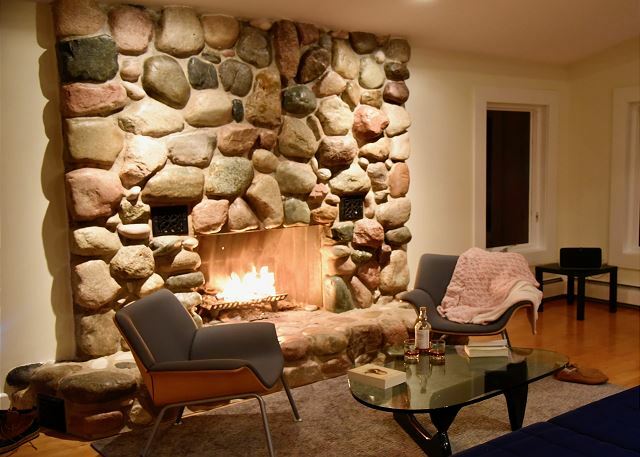 Only 1 of 19 "Cliff Homes" left in Michigan, you will love the panoramic views of Lake Michigan found in just about every room of this house. There is no shortage of gorgeous views here! 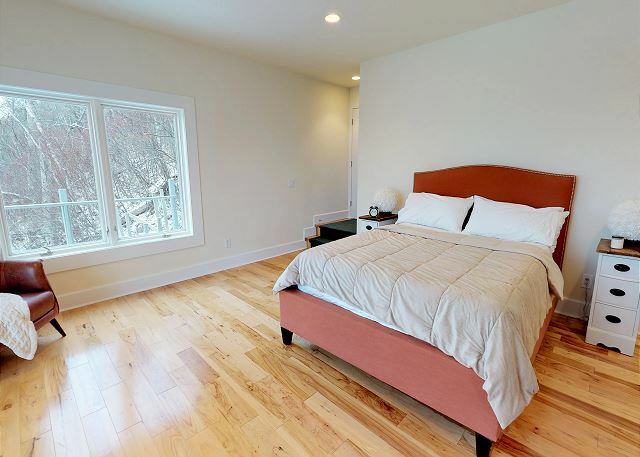 The open living space assures you no matter what you are doing you will be rewarded with a view. Sit and relax enjoying the breathtaking views out your window. Use the telescope to discover the many islands located in the lake. A slider leads to the upper side deck. You won't have to miss anything at all preparing a meal in this well equipped kitchen. The dining table seats eight with room for two more at the kitchen breakfast bar. Right off the main living area you will find a living room, so inviting and warm you may never want to leave. 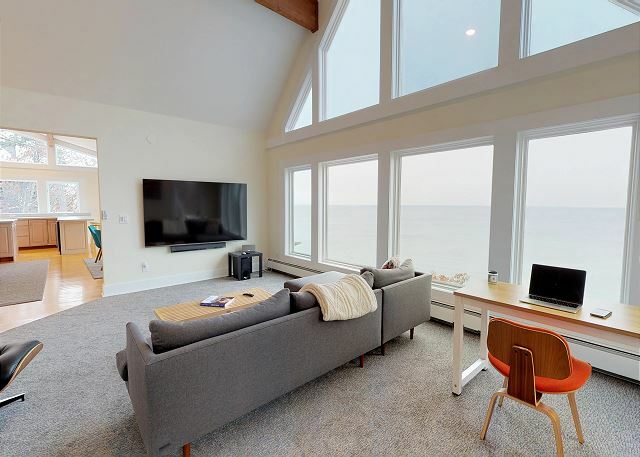 The living room has a large screen television, a work desk and a full wall of windows to enjoy every second of your vacation on Lake Michigan. 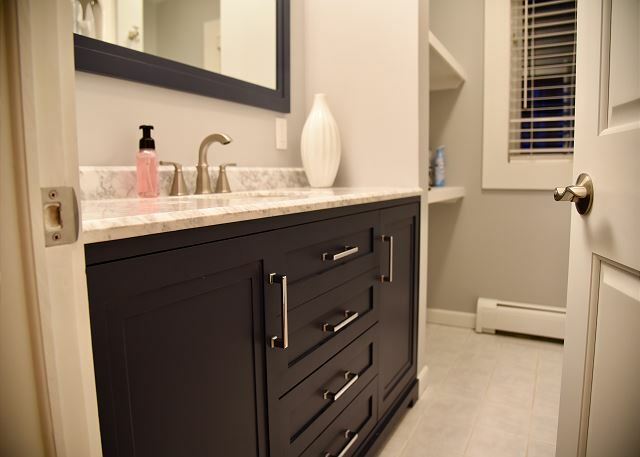 With a wall separating the Queen Bedroom, you will love the wide open concept of the lower level with two full over full bunk beds, sitting room and just down a small hallway, a full bath. If you can make it down the stairs, you will be rewarded with your very own private and secluded beach. Interestingly enough, during the winter months the beach becomes rocky, while during the summer months it is completely sandy. Not only is the lake beautiful and serene, but the surrounding woods too! 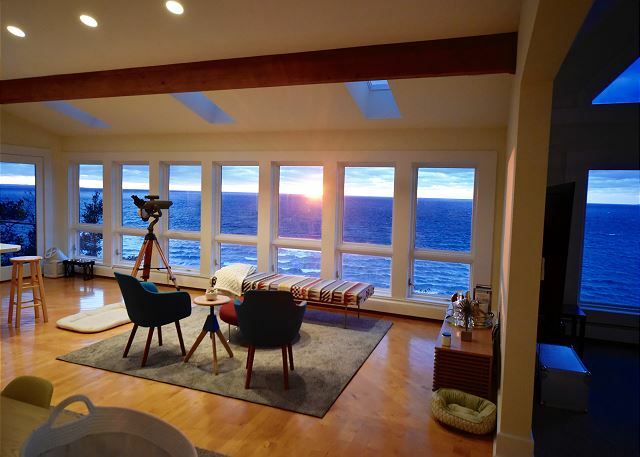 Wide open floor plan with incredible Lake Michigan views from almost every room. 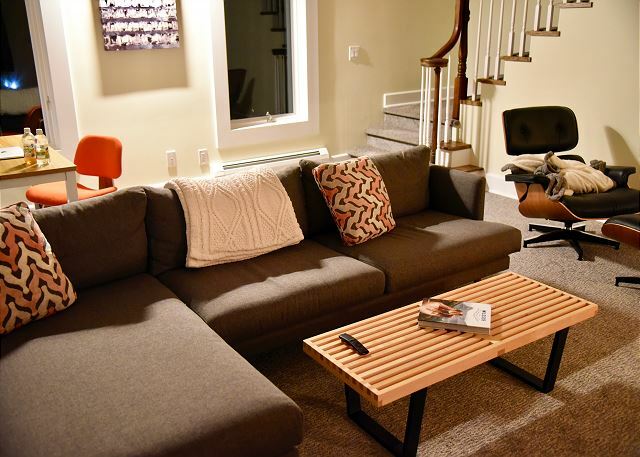 Modern and comfortable furniture throughout. Plenty of room to spread out, with room to sleep 14 people in beds! 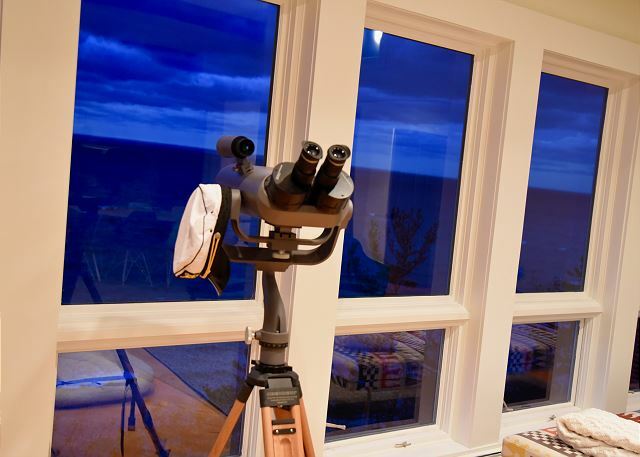 Enjoy the views and use of a powerful telescope that allows you to see the Beaver and Fox Islands clearly as well as Charlevoix to the south. 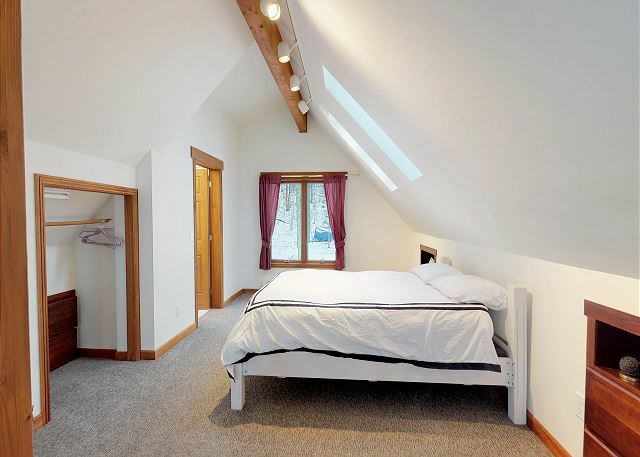 Private main floor bedroom, upper loft bedroom space, and a spacious downstairs gives plenty of room for families to spread out. Please note that the house does not have central air conditioning but does have a whole house fan. Internet access is through satellite and can be spotty due to weather conditions. Spectacular views from the two expansive decks on the rear of the home. Stairs down to the private frontage on Lake Michigan complete with a private deck at the bottom right next to the sand. 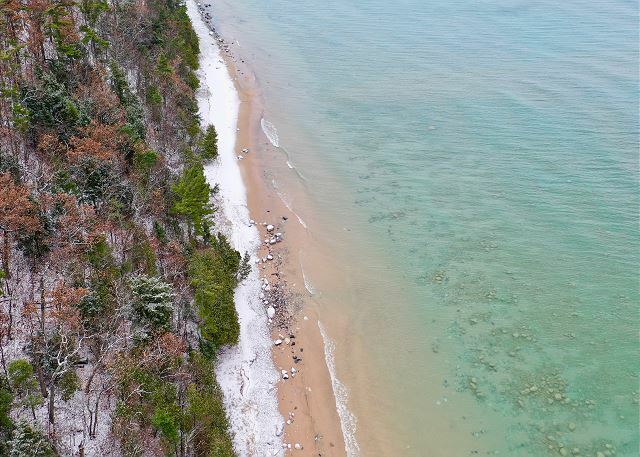 Extremely quiet stretch of beach with no other close accesses, it is truly as private of a beach setting as you will find in the Lower Peninsula. There is a family of bald eagles living on the property, you will enjoy watching them fly gracefully through the air, and you can even watch them go "fishing" in the mornings as you enjoy your coffee. 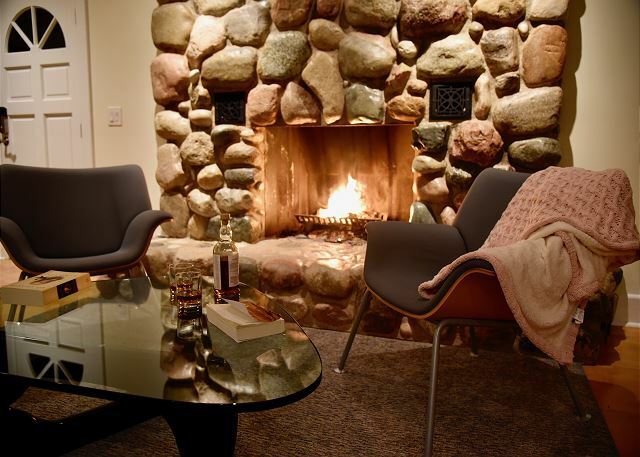 The house is located on the famed "Tunnel of Trees" and is close to many incredible attractions, such as Harbor Springs, Petoskey, Boyne Highlands Ski Resort, Nubs Nob Ski Resort, Mackinaw City and the Mackinac Bridge, Wilderness State Park, Legs Inn, and SO MUCH MORE! Parking: There is room for at least 5 vehicles in the circle driveway as well as on the vacant lot across the street which also belongs to the property. 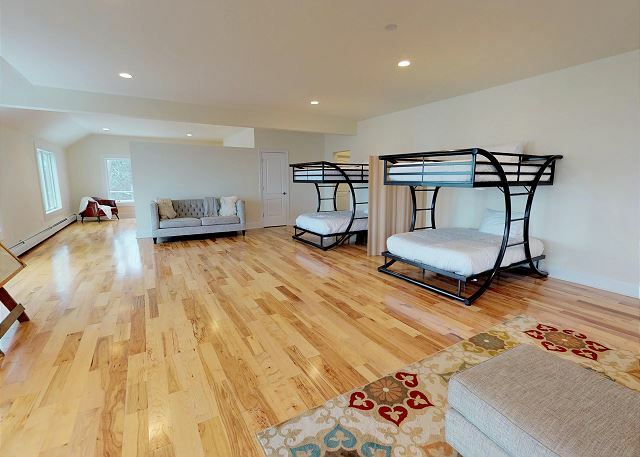 This home sleeps 14. All bed linens and bath linens are provided. There is space for 11 people to sit in the kitchen and dining room areas, between the dining room table (seats 8) and the breakfast bar (bar stools for 3 people). 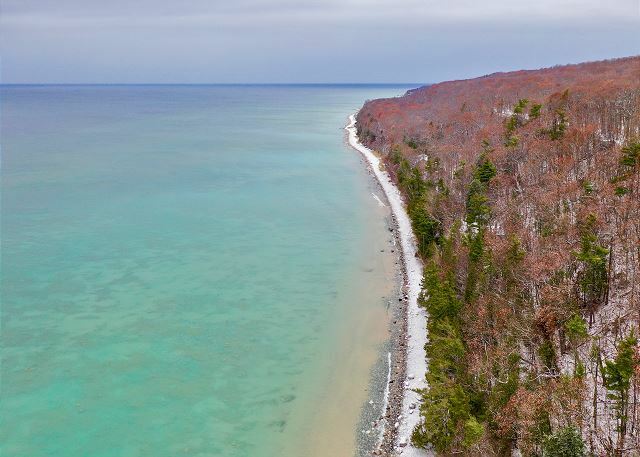 The property is located directly on the "Tunnel of Trees" just north of Harbor Springs. A beautiful spot for summer beach fun, fall color tours and winter seclusion and skiing. The house was great. Views of the lake were spectacular, especially at sunset. Loved the layout of the house being so open. One of the best equipped kitchens I have ever seen in a rental home. No major complaints, just a few inconveniences. The bath towels were extremely small and prevented modesty when walking from shower to change. Make sure to pack extra TP if going for more than a couple days, since they only provide two rolls per bathroom. We were warned internet could be spotty, but it did create some issues for guests that needed to check in with their jobs. House itself was very clean, but the driveway was covered in a significant amount of snow and ice. If you are brining a car in winter, make sure you have enough strong people to push the cars out onto the road. 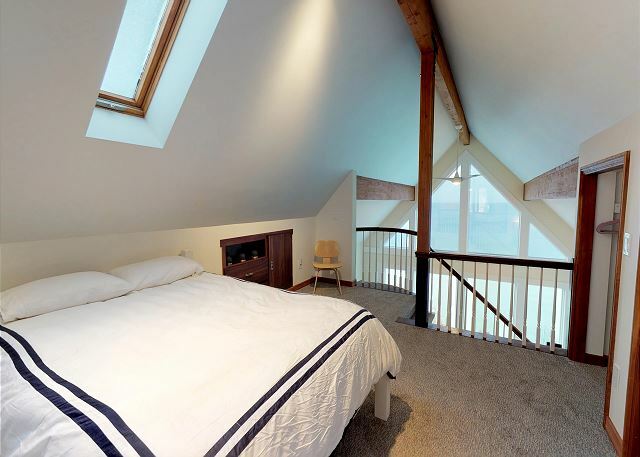 We loved staying at Claudia's Cliff House, it was better than home away from home. 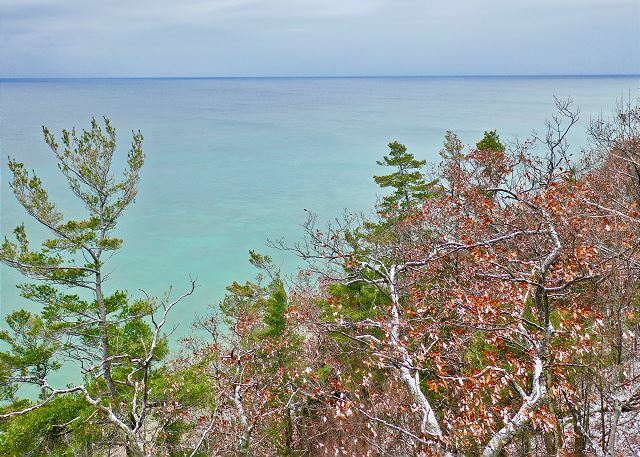 Beautiful view of northern part of Lake Michigan, across Beaver Island. Stunning sunsets, view of wild life (we saw a bald eagle go fishing! ), close to natural preserves for easy walks, or going to the lake for more adventurous terrain during winter. Only 20 minutes from the ski area Nub's Nob, and many quaint little towns along M-119, from Harbor Springs to Wilderness State Park. After stocking up with whole foods at the local grocery store in town, Claudia's home had everything we needed as to kitchen utensils, to make our own food after a day's play skiing or just enjoying the surrounding area. 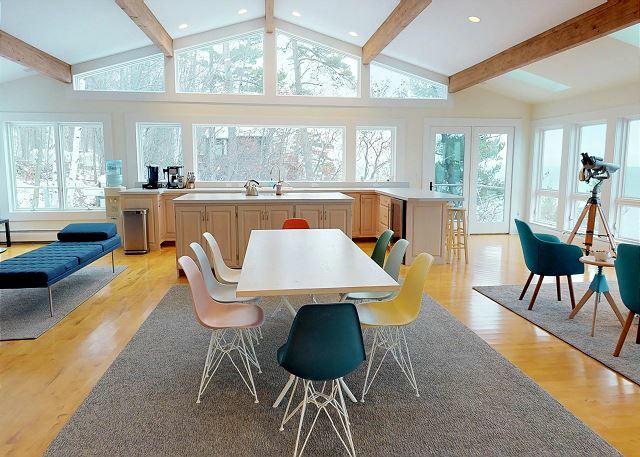 The open concept of the house allowed us to have a view of the lake while eating breakfast or dinner. The house is spacious, in the evening the adults could have a conversation sitting around the fireplace sipping wine for the evening, while the kiddos were on the opposite corner of the house (still in view) playing board games. The house is beautifully decorated, top to bottom windows allowing to catch a view of the lake no matter where you stood. Will definitely come back, next time in the summer or fall to enjoy the beautiful beach or fall colors. Thank you Claudia!!! We loved your home!